Since 1972, California law has forbidden builders and homeowners from building on earthquake faults that cross their property. 40 years later, some of those strips of hazardous land have turned into amenities: unexpected greenbelts that have attracted high-value homes and people to match, according to a study in the upcoming issue of the journal Earth's Future. The 1972 law began as the Alquist-Priolo State Special Studies Zone Act, a name designed to reassure the skittish. It mandates that the state map all hazardous active faults, and all property owners within a certain distance of the fault must disclose the fact to would-be buyers. Wouldn't this scare people away from houses sitting next to an earthquake fault? The Bay Area's largest set of such homes is on the Hayward fault, which runs the length of the East Bay from Point Pinole to Fremont. 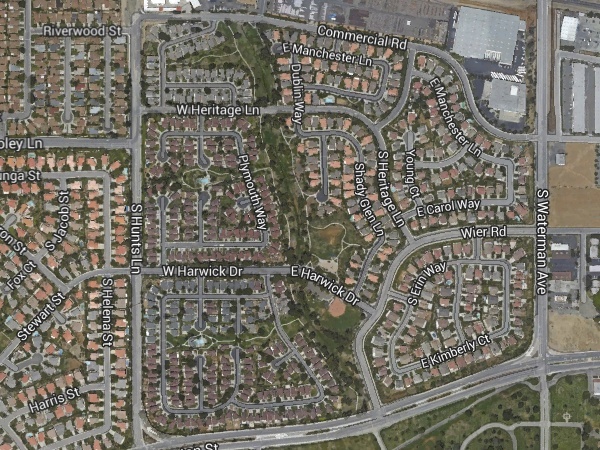 I've heard stories of fault-line residents who resent visitors gawking at their cracked sidewalks and warped driveways. I once owned a home in an Alquist-Priolo zone, and it was a nervous-making experience to inform prospects during the sales process. Yet the homes still sell. And now the law has a more straightforward name, the Alquist-Priolo Earthquake Fault Zone Act. Existing homes on the fault are exempt from doing much about it, which takes some of the sting out of the predicament. So while you'll see decrepit houses or vacant lots here and there along our active faults, studies have shown that the Alquist-Priolo law has little effect on home values. The law makes a real difference in greenfield developments, where new homes are built on previously empty land. In the new study, a team of researchers led by Nathan Toké started out thinking that the law might stigmatize these places, but they found instead that wealthy people appear to be attracted to the fault. For a fun way to use Google Earth, plug in the government's maps of earthquake faults as you hover over Southern California cities. You'll soon see places where greenbelts and parks line up along an active fault. 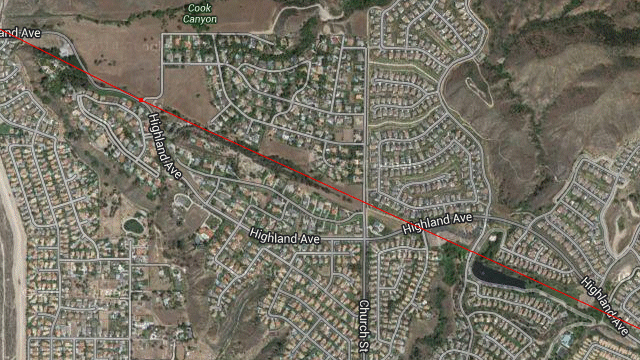 This image shows part of the suburban town of Highland, just east of San Bernardino, where the San Andreas fault runs. This curious pattern is familiar to most of us who think a lot about earthquake policy. Toké's team went a step further, using geographic databases to examine the effect more precisely. They had detailed census data to overlay on the official Alquist-Priolo mapshousehold wealth, residents' ages, minority status, population density, age of the housing stock and so on. From this data they devised a measure of "social vulnerability" for each census tract. As expected, their analysis showed that highly vulnerable tracts are clustered near environmentally toxic locations. But when it came to the hazard of earthquake shaking, Alquist-Priolo zones are favored by what you might call the socially invulnerablewell-off people with good jobs. Toké's team turned to satellite images and showed that the same pattern holds in terms of green vegetation: while toxic zones (with their socially vulnerable inhabitants) are barren, the Alquist-Priolo zones are lush. Finally, they zeroed in on a handful of these paradoxical places and looked at the real estate. These new developments with their "fault zone parks" have the most valuable land parcels. Toké concluded that "people with access to financial and political resources, those with low social vulnerability, strive to live in neighborhoods with parks, even in the face of forewarned risk from natural hazards." This all makes intuitive sense once it's explained. And it's plausible that new homes near the fault would be built extra strong for their wealthy buyers. That's how we want things to be. But for the rest of us outside the Alquist-Priolo zones, the law adds no protection against earthquake shaking (or the other hazards endured by the poor). Toké points out that the law's unintended effect was to attract "socially empowered residents" to the fault zone by promoting parks. "The effort to mitigate earthquake hazards thus, in surprising ways, may help reinforce existing environmental injustices." More parks elsewhere might be the key: "One of the most important observations from this study is that the distribution of high social vulnerability is more strongly tied to the absence of the amenity of parks and greenspace than to natural hazards." A more pressing question that Toké's study did not address is what to do with Alquist-Priolo zones that are covered with pre-existing homes. What can we do on the Hayward fault? We will not know until the next major earthquake clears the ground there, in which case the work of Toké and other researchers may give us some clues for how to rebuild. A telling example might be that of Signal Hill, a little city surrounded by Long Beach. It sits on a hill raised by forces on the Newport-Inglewood fault and is surrounded by Alquist-Priolo zones. The hill was empty and available for residential development because history gave this locality a different sort of earthquake: for over 50 years it was a giant oilfield.